Powers/Abilities: The Pixiu had strong mystic abilities including the ability to sense the location of anyone at least within the city of New York, if not farther, provided it had a photo. Strong magic was capable of dampening the Pixiu's ability to locate. It could also project mystic holograms such as city maps. Its diet consisted entirely of gold and it was unable to defecate. According to myth, it could transform the life essence of those it defeated in battle into wealth and was strong enough to battle evil spirits. History: (Heroes for Hire II#2 (fb) - BTS/ancient myth) - The Pixiu violated a law of Heaven and was punished by having its diet restricted only to gold and being rendered unable to defecate. (ancient myth) - The Pixiu became known as a fierce creature capable of battling demons and evil spirits, and transforming their essence into gold. (Heroes for Hire II#2 (fb) - BTS) - Over eighty years ago, ten chosen climbed the Xian Ghost Mountain to steal the Pixiu's egg and only one, the man who would one day be called Mister Qui, survived the encounter. Qui kept the Pixiu contained within a mystic circle in order to obtain its services. (Heroes for Hire II#2) - After being unable to locate the fugitive Captain America via Humbug's insect intel, the Heroes for Hire traveled to Chinatown to meet with their connection, Mister Qui, who allowed the group to commune with the Pixiu. After Mister Qui revealed how he obtained the Pixiu egg, he led the Heroes for Hire into the room housing the Pixiu, who immediately began insulting the Heroes. When Colleen Wing opened a briefcase of gold, however, the Pixiu demanded it. Misty Knight explained their proposed business transaction, offering the gold if the Pixiu could locate Captain America. Threatening Misty to give her the gold, the Pixiu was reminded by Misty that it was powerless within the mystic circle that housed it and repeated that if the Pixiu could locate Captain America, it could have the gold. Angrily claiming it would adorn itself with Misty's innards, the Pixiu relented and revealed that Captain America was within New York City but that magics were obscuring his exact location. Projecting a mystic map of the city, the Pixiu pointed out the closest location of Captain America to best of its ability, exclaiming that the preventative magics were infantile. 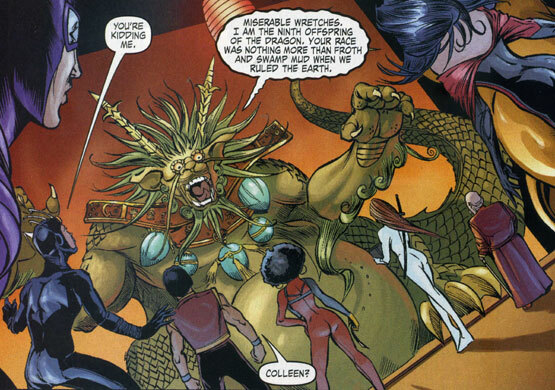 It then demanded the gold and Shang-Chi tossed it a bar of gold before the Heroes for Hire departed. Comments: Created by Justin Gray, Jimmy Palmiotti, Billy Tucci, Francis Portela and Tom Palmer.